ANALYSIS: Baltimore destroyed exactly the kind of urban-friendly infrastructure that San Francisco used to fashion its smart transit network. 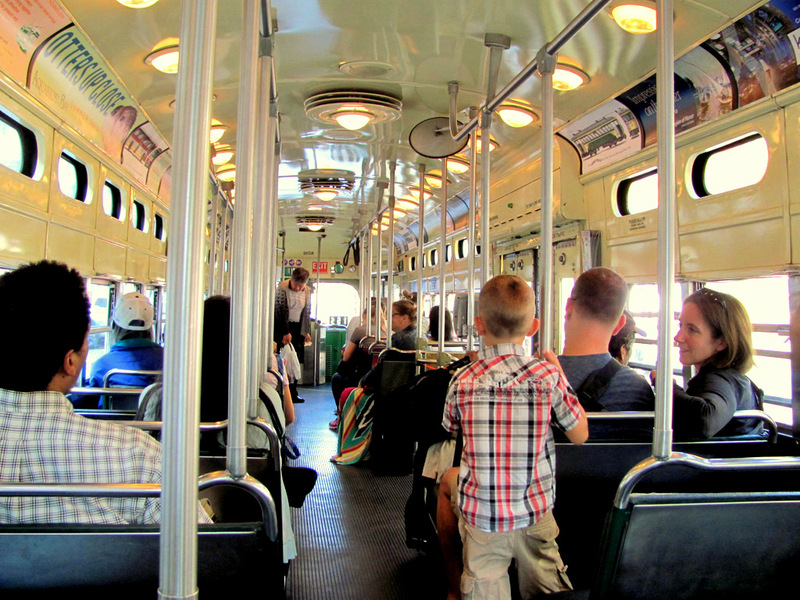 Above: Inside a refurbished streetcar that runs through downtown San Francisco. San Francisco was covered in fog when I visited it in December 1977. Walking in the drizzle through downtown, I remember Market Street looming up as a spectral checkerboard of dirty barricades marking an uncompleted subway station. Baltimore at that time was basking in the glow of its rebuilt Inner Harbor. Mayor William Donald Schaefer had cast his manic charm far and wide. Reporting for The Sun, I regularly ascended the freshly-minted World Trade Center to hear the latest “good news” from Walter Sondheim, the patrician chairman of the management group that oversaw the renewal. Fast forward 36 years. The fog’s still there, but San Francisco has become a textbook example of successful urban revitalization. Its boasts the highest population in history (over 800,000) as demand far outstrips the supply of Victorian “painted ladies” at Alamo Square and the more prosaic bungalows in the Sunset District. Back on the Chesapeake, meanwhile, Baltimore has shed 165,000 residents since 1980 (on top of the 150,000 lost in the 1960s and 70s), triggered by the outflow of jobs, a rapidly deteriorating housing stock, crime and other ills. And one of those ills, I kept thinking as I re-explored San Fran last month, was transportation. San Fran has performed miracles with its existing transit system. 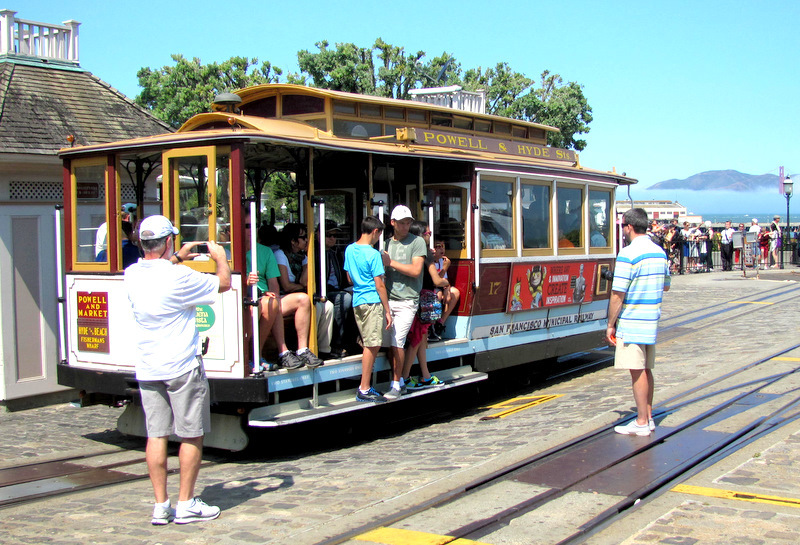 I’m not referring to the cable cars that delight tourists but carry less than 1% of daily ridership. Or to BART, the excellent regional subway network that connects Fog City with Oakland, Berkeley and two international airports. I’m thinking about the city’s reinvention of its streetcars and “trolley buses” to serve a land of famously steep hills and narrow streets. 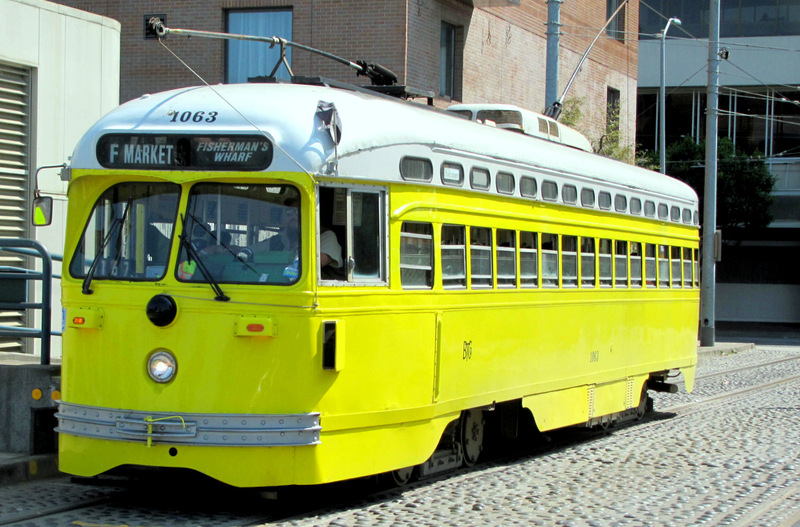 We are approaching the 50th anniversary of the last streetcar operation on November 3, 1963. Sondheim and his influential friends didn’t want to see “old-fashioned” trolleys running through their rebuilt downtown, so they demanded the conversion to buses. Those freight railways lingered on Key Highway, Light Street, Pratt, President, Aliceanna, Thames and Boston for another two decades, a readymade right-of-way for a trolley “circulator” that could, right now, be shuttling residents and tourists to the city’s waterfront attractions and neighborhoods. But they, too, were paved over. What we destroyed here in Baltimore is exactly the kind of urban-friendly infrastructure that San Francisco used to fashion its smart transit network. This was brought home to me as I rode a streetcar cloaked in canary yellow and emblazoned with “BTCo” on its flank. 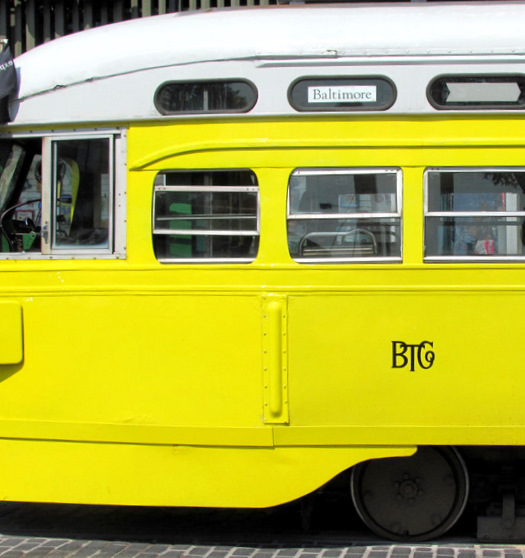 The initials stood for Baltimore Transit Company, predecessor of the MTA, and it runs in San Francisco to commemorate the once great trolley fleets of American cities. The car and its fellow vehicles from Chicago, Kansas City, El Paso, Birmingham, Louisville, etc., are not tourist baubles. They are quick accelerating, smooth riding jackrabbits that hopped past more bicycles than cars on The Embarcadero, a waterfront street liberated when a two-tier freeway above it was torn down in 1991. Just past the bustling Ferry Building, the Baltimore car turned onto a scene I could scarcely recognize. In place of those barricades, a revitalized Market Street featured a parade of ritzy stores and office towers. The streetcar shares the road with trolley buses and, this being San Francisco, hordes of bikes. Below ground, eight-car BART trains link the city with the East Bay suburbs and the main airport in San Bruno. And below BART is the Municipal Railway (Muni) Metro that carries one-and-two-car “light rail” trains. 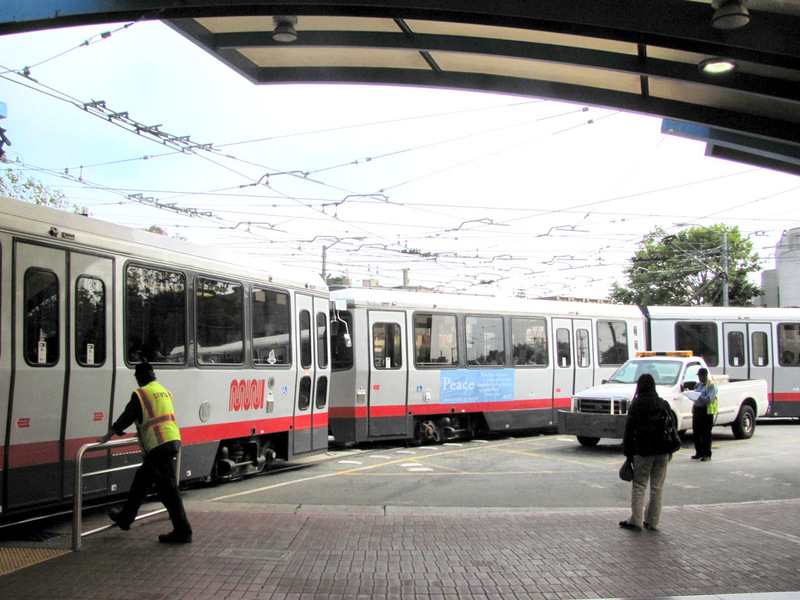 BART and Muni share the four stations along Market Street, making it easy to transfer from long-haul to short-haul trains, and from either system to surface transit fanning out from downtown. 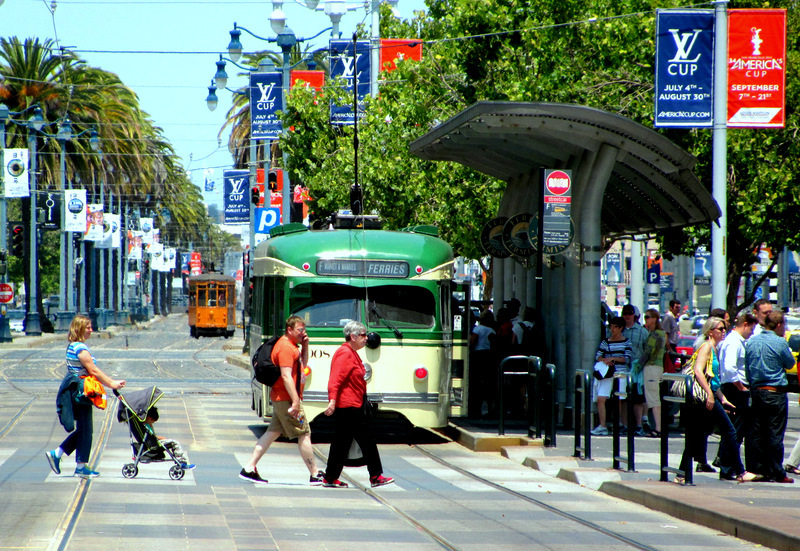 Altogether the city has 17 trolley bus lines, seven light-rail lines, the downtown streetcar and three cable-car routes. The trolley buses are perhaps the most ingenious adaptation to the city’s geography. They are so popular in this environmentally conscious city that plans are afoot to electrify some of the standard (diesel) bus routes. The trolley buses mostly operate in the downtown and Western Addition. In the middle-class neighborhoods south of Twin Peaks, former streetcar lines have been converted into light-rail service that operate with trains equipped with retractable steps that serve both high-level platforms and streetside curb stops. These lines serve some of the city’s big institutions (University of California Medical Center, San Francisco State University). They are also slated for expansion, along with a new “crosstown” subway linking Chinatown with South Beach and the Transbay Transit Center, terminus of the planned high-speed rail line to Los Angeles. Over the years, San Fran’s transit systems have survived clueless politicians and were wounded by countless assaults, but endured to become the bedrock of a city remarkably free of parking garages, expressway ramps, gas fumes – or vacant buildings, abandoned houses and empty lots. What five days as a tourist taught me: smart transportation matters. Smart transportation builds on the foundations of “old” systems of proven value. Smart transportation avoids overblown schemes, rich in consultant contracts and government handouts, that flounder for decades. 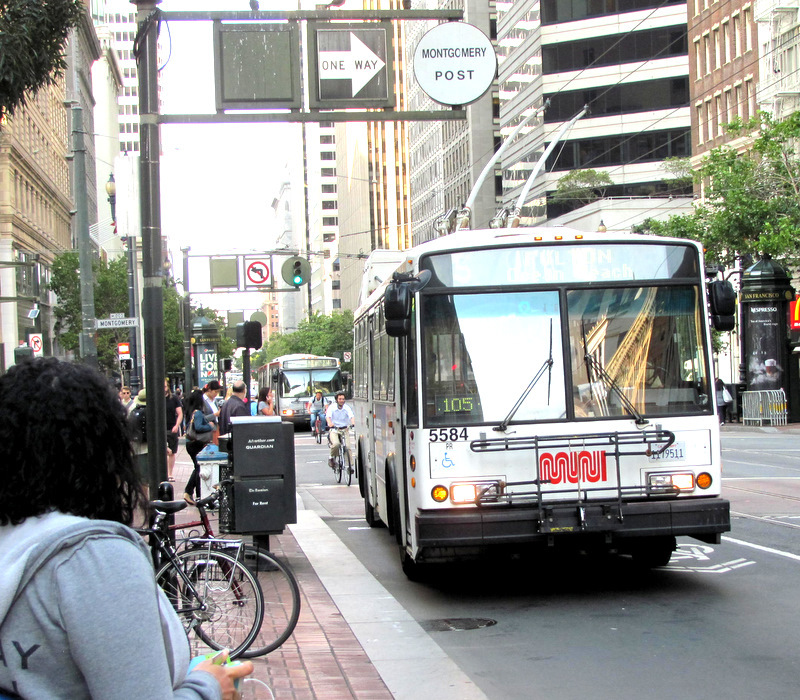 Smart transportation creates a civic mindset that compounds its own success to the extent that when a record-breaking 1.2 million people came to march in the Gay Pride Parade this summer on Market Street, the majority came by train and trolley.